The fall in oil prices will significantly benefit Britain’s economy, a leading think tank has said, as the country continues to outperform most European countries in economic growth. The research, published by the National Institute of Economic and Social Research (NIESR), also predicted the UK would experience continued growth next year, rising from 2.9 percent of GDP from its previous forecast of 2.5 percent. “This is almost entirely due to the sharp fall in the oil price. Not only does this boost consumer spending … it also improves the UK’s trade balance,” the institute reports. The predictions come as oil continues to fall, with the price of Brent crude falling from $115 a barrel in mid-2014 to around $58 a barrel now. “We expect growth to moderate in 2016 and beyond, as the positive impact of the oil price shock dissipates and domestic demand growth softens. Offsetting this is a strengthening global economy that should support the recovery in the growth of exports,”the report says. The Niesr report also predicts a fall in unemployment from 5.8 percent to 5.2 percent by the end of 2015, although it has warned that a sustainable growth is a domestic risk. “But beyond this, it is the performance of productivity that is key to real wage growth and it remains the most significant domestic risk to the UK's economic outlook,” the report says. 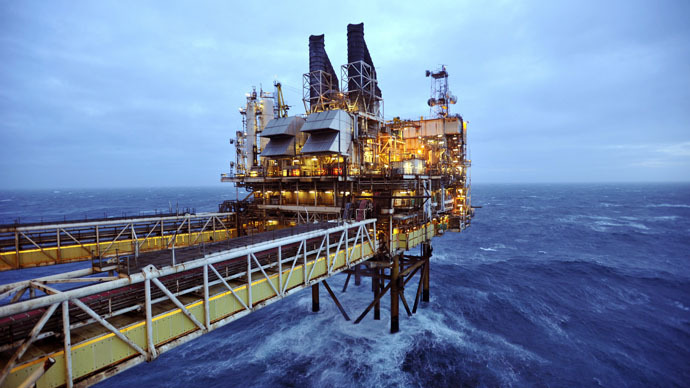 The data follows reports that Britain faces losses of over £200 billion due to the decommissioning of oil production in the North Sea. Speaking to the Daily Telegraph, a number of representatives from Britain’s biggest oil producers warned that the industry risked losing 6 billion barrels of oil under the sea bed, which would not be extracted due to a lack of available resources. The firms also urged the government to reform the tax regime in order to allow easier access to sites for offshore drilling. “The danger is that if we lose momentum now and lose recourses and assets, and don’t get the fiscal regime fit for a quite highly mature area, we will come down to 10-11bn (oil reserves). That’s a huge economic loss and jobs loss for the UK,” Sir Ian Wood, a Scottish oil expert, told the Telegraph. British Chancellor George Osborne is also under pressure to implement new tax cuts and incentives to encourage off shore exploration in the North Sea when he presents the final budget in March, before the general election. Additionally, the UK’s major oil suppliers, BP and the BG Group, warned that falling profits from the oil trade would damage the British economy, with some calling for government support in order to prop up places like Aberdeen, where the majority of its local economy is focused on oil production.